Solagratiamom: Classical, Creative - Do They Go Together? Classical, Creative - Do They Go Together? Dressing up stuffed animals or having tea parties with a puppy - it's all in the name of imagination and good fun! I always try to encourage my daughter's love of dressing up, making things (or as she calls it -being an Inventor) and any games or projects she comes up with herself. She thinks she's playing and having fun, but Mamma knows that she's actually developing a very important skill - learning to think as she creates and problem solves through what is in her head and what she is able to actually get to work in real life. It's a fabulous process! One of the things we like to do with our CC memory work is try to come up with some of our own creative ways to help us remember the various information. It can be a silly story, a fun set of hand motions or a play on words. Just this morning we were drilling for Latin and she stumped on which list began the Present Perfect Tense and we stopped to think of a creative way to help her remember it. She came up with "I gave the present and it's perfect! So present perfect tense starts with I" That helps her now to remember the list starts with I. If you have been following me for a while, then you know that I love to have the kids dress up in something related to our history sentence and focus a lot of my creative energy on making science come alive. "The imagination is powerful" according to Einstein and I would think he should know! 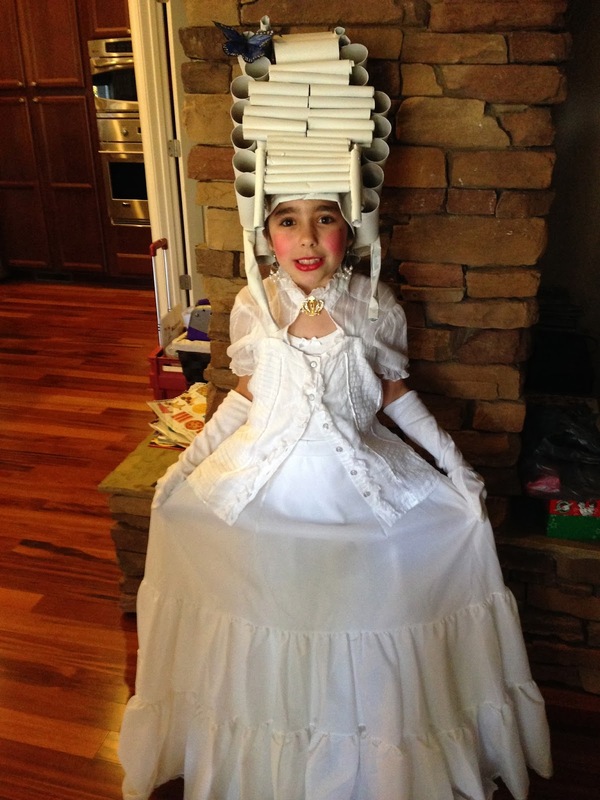 When kids dress up it engages their imagination, especially when the costumes have homemade elements to them. It also engages their minds to ask questions about the history subjects or the time period. I know when we were working on Marie Antoinette, my daughter began asking me questions about her and we ended up on the computer googling all sorts of information about Marie and the time period. That's what I want! Having worn that heavy wig she then could imagine how difficult it was to move about with the hairstyles of the day. She had an experience that gave meaning to the words on a page. Don't get me wrong, words on a page are very important to me as well, but I love to take key things and bring them to life to engage the mind in a new way, providing a sensory experience that will last for many years to come, if not a lifetime. Of course, we don't do this with everything and not every costume sparks her interest as highly, but she is now in the habit of imagining, dressing up, creating characters, acting them out and imagining a life different from her own. So what motivates me to do what I do and how does it fit the classical model of educating our children? My first answer is...do we not study those who have mastered the creative process to it's maximum? Leonardo Da Vinci, Rembrandt, Michelangelo, Beethoven, Bach, Einstein, Edison, and Shakespeare- to name a few. So to me, creativity is a HUGE underpinning of a classical education! It may seem like we're just making a cool memory and have some cute pictures when we're done with a Wonderful Wednesday, for example. However, there is so much more that we are teaching our kids, that goes beyond a book or a notebooking page. Let me explain what my reasons are for being creative in education -especially for the younger aged kids or kids that have special needs of any kind (I would say through age 12 or beginning the Challenge level)…. It allows freedom from rules based play and encourages the imaginative process -which is the beginning of invention. It causes them to ask questions, which is a doorway to dialectic discussion down the road. It expands their understanding of their relationship to the world around them. It provides opportunity for leadership and expanding relationships with others. It kick starts the creativity process which is key down the road to entrepreneurship and scientific discovery ("You can't depend on your eyes when your imagination is out of focus." ~Mark Twain). It takes something that could be boring and disconnected from a child's perspective and brings it to life creating interests they didn't know they had. It teaches out of the box thinking when re-using or repurposing materials for costumes and projects. So let me expand on those thoughts. Freedom from Rules Based Play "Logic will get you from A to B. Imagination will take you everywhere." -Albert Einstein Anyone who knows me personally, knows I am a "rules based person"! I'm also far from an unstructured person or employ any sort of "unschooled" methods! However, I do see a place and time when freedom from rules is good and necessary to a child's development. I think the process of history dress up and then letting the children act out their version of what that period or person may have been like is helpful to their intellectual development. When there are no "adult rules" to the games they play, it's interesting to see who emerges as the leader in the play and how that may change from dress up theme to dress up theme. It also is interesting to watch how they develop out their ideas and work as a team to come up with creative ways of playing out what they imagine. They begin to invent their own rules to play by and function together as a team to build. No rules based play can illicit these things more beautifully. I also find giving freedom to utilize non-conventional means of working out a problem can go a long way too. I have worked many a teddy bear in my day by letting them become the math manipulatives for a days math lesson. Breaking free and using imagination to teach concepts is a great way to create out of the box thinkers! Questions are a Doorway to Dialectic Discussion Later I find that kids when presented with a few props and an overview of information, will be prompted to ask lots of questions. They begin to ask questions to find out more information about the prop "How was it used? When was it used? Why was it used? Who used it?" all begin to form in their minds. It stimulates the beginning of critical thinking as you illuminate ideas with the asking and answering of questions. Asking questions to get them to think through the possible answers on their own, is a good starting point for later dialectic discussion and reasoning as a means of investigating answers. Expands Their Understanding of their Relationship to the World Around Them "Knowledge is limited. Imagination encircles the world." - Albert Einstein. I have watched children for many years now (14 to be exact) do various things to understand the world in which they live. I've watched typically developing kids and kids with special needs, all work these things out in their play. I can read a book to a child about a different country or culture or period of time and it often has minimal meaning, but when they wear the dress or experience the food - now their world has expanded a little bit and their understanding of how they fit into it has just expanded with it. I think reading rich literature about people living lives very different from our own is great to expand this area of understanding. However, I think it's even greater when you "show" them alongside. For example, reading The Diary of Anne Frank we discussed the dimension of the room she slept in. It sounded cramped but then we found a place in our home that was about that size and we went in there and "imagined" what living and sleeping there would really feel like. It had a new meaning now and how their life compares with that meaning is part of helping them discover their relationship with the world they live in. Expanding Leadership and Relationships "Imagination is everything. It is the preview of life's coming attractions." - Albert Einstein Kids dressed up with free space, begin to imaginatively play together. You see leaders emerge and then fall back, and you see them develop and try out their skills as leaders of one another. You also can see them sharpen their skills of reciprocity, working relationships -as they work out how the play will proceed and respond to the actions and imaginations of each other's play. It's a beautiful dance to watch among children and the older the child, the more elaborate and well thought out you see this process become. Creativity Process "I'm enough of an artist to draw freely upon my imagination." - Albert Einstein I love to invite children to be creative. I think most people think of creativity as being art and music, however, I think of science and business! It takes creativity for a scientist to discover a new cure and it takes creativity for a business to be started or a marketer to think of new ways to increase sales. Creativity focuses on the process of forming original ideas through exploration and discovery. It's not about doing something better than someone else but rather the process of making - which results in thinking, exploration, discovery and imagination. Making things Living "The true sign of intelligence is not knowledge but imagination." -Albert Einstein. When I think back to school days for myself, one of the very boring subjects I recall painstakingly getting through, was history. There was all this information to read about people I couldn't relate to, lack of visual information (for a very visual learner) that made it hard for me to "see" what I was reading and there were time periods I couldn't relate to and understand. (Now I LOVE History and enjoy teaching it with a classically creative approach!) Science was formulas - ad nauseam -no real meaning to me - until we got to experiments and then my interest was sparked but often they were too few and too far apart to really engage me in the subject. (Now I love Science too!) 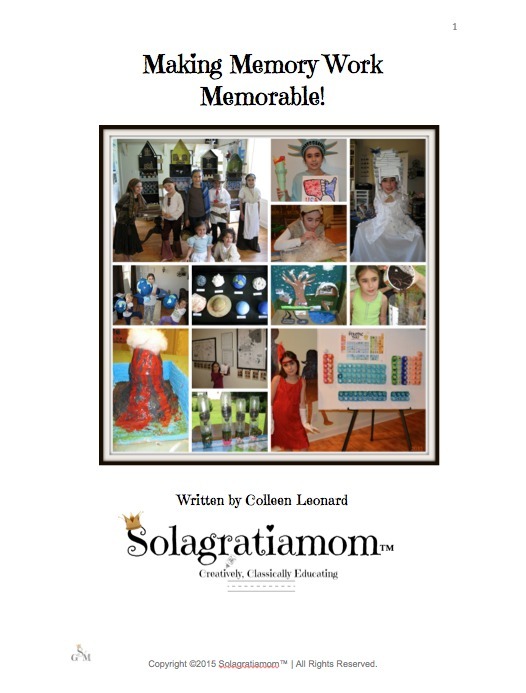 Making history come alive and become relevant to your child is a way of really engaging them in the subject. You can show pictures to your child of 1700's hair and talk about what it must have felt like to wear their hair that way and how they may have had to walk to compensate for it or how a skirt with a large hoop in it felt; but to experience it is a whole new level of understanding and relevance. I can talk about how meteoroids, meteors and meteorites are different and describe that to my children, but when I do a sensory related art project showing them the differences -then they really understand it and have a visual picture in their head that sticks. So creativity sparks imagination which sparks interest in topics that may not have been an interest at all, prior to that experience. Recycle and Upcycle "Thanks to my mother, not a single cardboard box has found its way back into society. We receive gifts in boxes from stores that went out of business twenty years ago." - Erma Bombeck Those who have seen my garage, know that this quote is me! LOL I enjoy finding a creative use for something that has potential to be used again, in a fashion not as originally intended! It's a great skill to possess - I look at old wine corks and see totem poles or dried out beans and see astroids or egg cartons and see dragons! I want to teach my children that skill too. Not only is it helpful to our environment as good stewards of God's earth but also it is a way of thinking out of the box, helping them to see solutions that others may not because they look beyond things at things differently then how they are intended. I know this has translated to being an effective partner with my husband while flipping homes. We could together walk into a property and see things different then what they were, discuss how we could redesign or repair them and made a good team flipping homes on the side! So create, imagine, dress up, use non-traditional items to teach traditional subjects, recycle and enjoy teaching your children - it is a creative classical approach to learning! I love your new header and the slogan. It's prefect for you and your blog! Thanks for sharing this perspective of classical education. I am not super creative naturally (and neither is my son), but now that my little girl is becoming more a part of school I am seeing the importance of letting creativity flow! The good thing is that her creativity and imagination is helping my son as well =) Great post, Colleen!